Makai Pauva/Makka Poha are a very important part of Indian Gujarati Cuisine. Makai Pauwa is usually fried in hot oil so that it puffs up, for consumption as a snack. It is an important ingredient of the Farsan, Chevda and Namkeen. 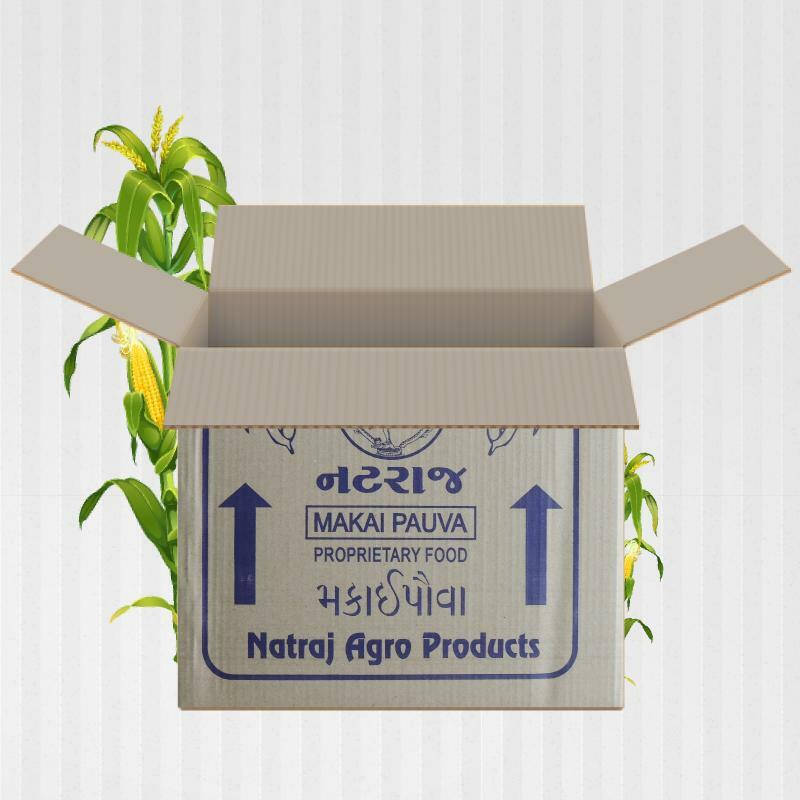 Natraj Agro Products is one of the biggest largest Makai Pauwa (a proprietary food) Manufacturers & exporter from Surat, Gujarat, India. 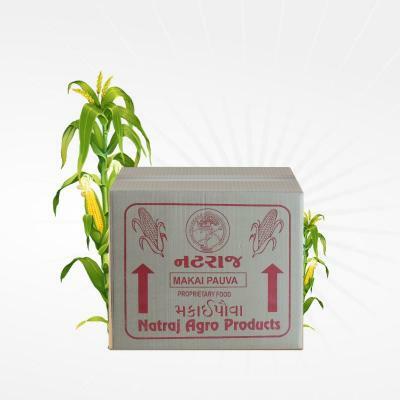 Nataraj Agro provides best qualities of Makai Pauwa which have high nutritional value and have low fat. Natraj Agro Products are very popular in Gujarat and all over India. We produce tons of Makai Pauwa every day, which we are now planning to expand. 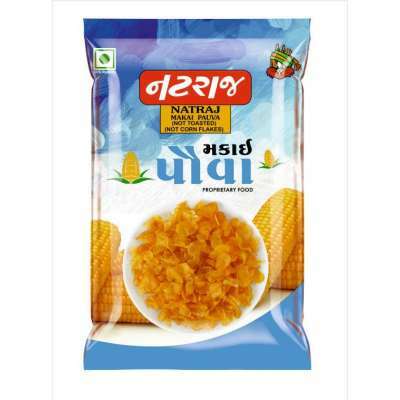 Our specially manufactured Makai Pauwa are widely used in breakfast and can be added to various dishes of Namkeen. The unit has been segregated into several partitions, which helps in the safe storage of the products and later their retrieval becomes easy. The main difference occurring in the both the process is the toasting process which changes the attributes of the finished products. 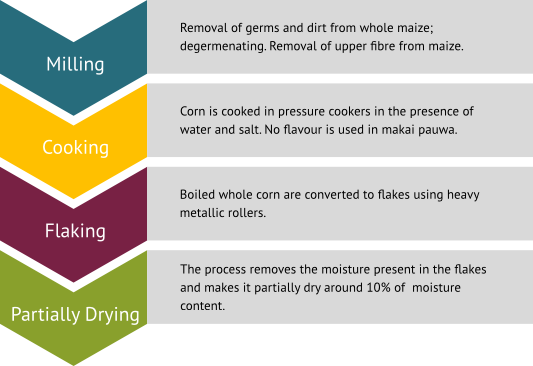 (color, moisture content, nutritional values and its consumption). Temperature of toasting, moisture content results different qualities. 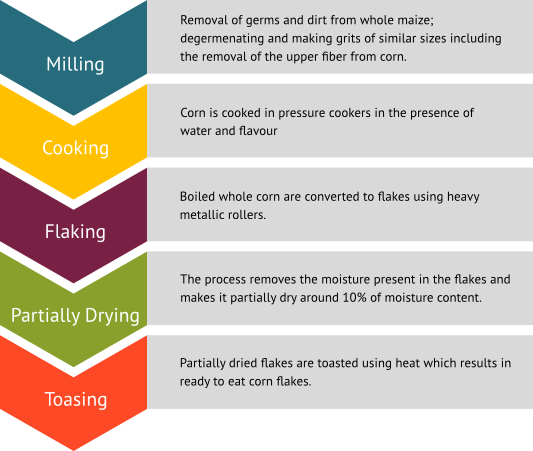 Usually the toasting process is conducted below 10% moisture content in the flakes. (B. Sumithra, Sila Bhattacharya 2007). Hence the total crisp structure and the rigidity of the finished becomes different when the toasting process is carried out. The other major difference between them is the corn flakes are a breakfast cereal which are ready to eat food while the makai pauwa are not ready to eat food, they are fried in oil and then consumed with added spices to it.